When I was invited to participate as a Corporate Superstar at Dancing With Chicago Celebrities 2019, I was ecstatic! This became the perfect opportunity to help raise funds for a wonderful cause while doing something I love - DANCING! All my life, I’ve loved dancing. From performing with my church’s Serbian Folklore Group around the country to dancing the night away at every party and wedding I was at, it’s always been an absolutely joyful activity in my life. 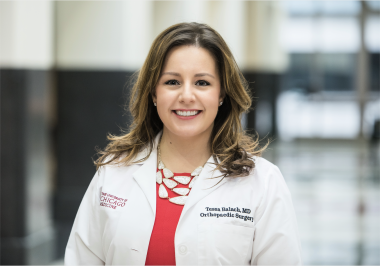 When I became an orthoapedic oncologist, I discovered another joy: relieving pain and returning function to people who suffer from cancer, with breast cancer being one of the most common diseases to affect my patients. Over the past 13 years this organization has raised over $2.5 million for the fight against breast cancer. It has literally happened one dollar at a time. There is no more efficient way to get your donation into the programs that are on the front lines. DWCC (still) have no paid staff and this work is truly a labor of love which means the donations have even more impact. Thank you so much for your support of breast cancer research and access to care for women with this disease. Every single dollar helps! If you'd like to attend the event and cheer me on as I compete, you can find tickets here: Tickets! Deepa Sheth 3/7/2019 $150.00 Good luck!